The 2nd to last weekend in June, Teh Sister came to MD so she could get a free ride and be my sing-along buddy for my trip to NY for our cousin's wedding. Where we once would have killed each other, we actually enjoyed each other's company the entire trip. There weren't even any death threats and when "Dead Bodies Everywhere"* came on, I even changed the song since I didn't need to threaten her. *Yes, I once "let Teh Sister listen to my discman" on a trip to NY.. That was the only song I let her listen to. Teh Sister arrived in MD on Tuesday, I worked Wednesday and she went boots hunting, and we left for NY on Thursday morning. 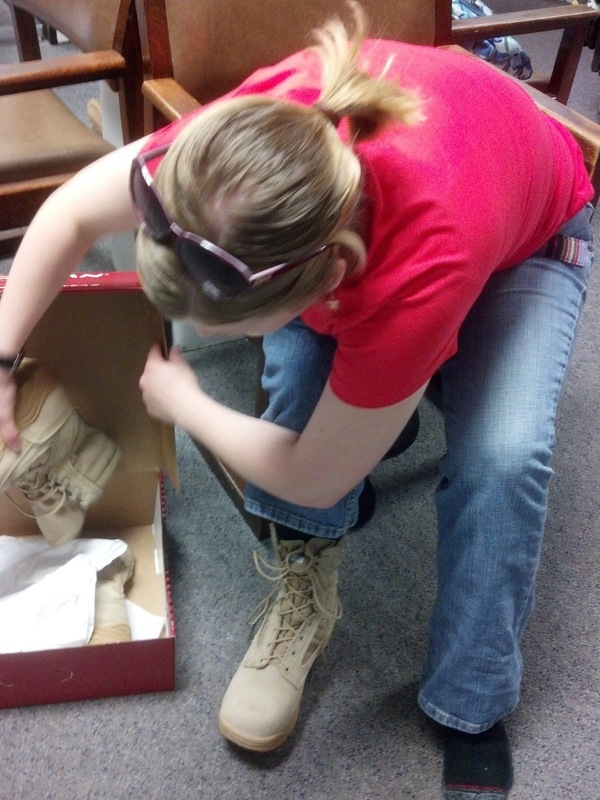 We stopped at Fort Meade on our way through and she was finally successful at obtaining new boots. New boots for broke girl. We also stopped at the base thrift store (AWESOME) and she was able to find some pants (with tags!) in her new size. 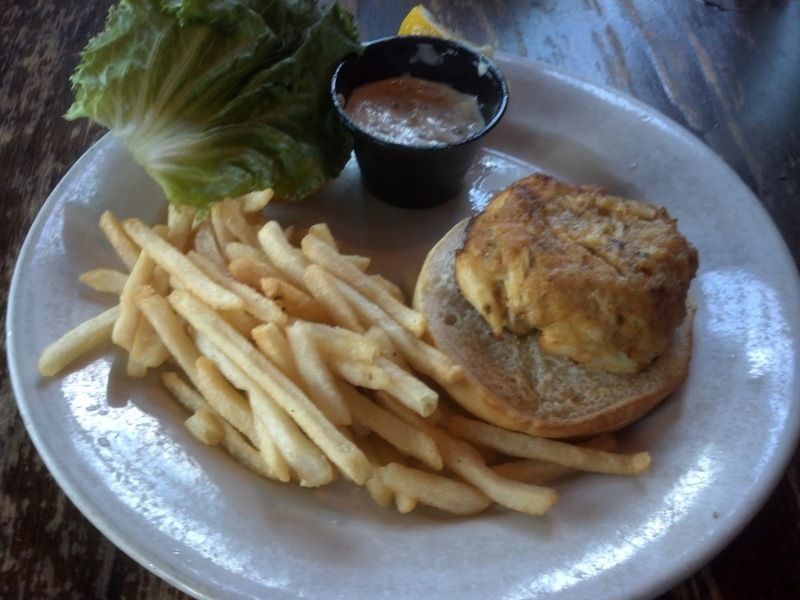 Armed with cheap jeans and expensive boots, we decided it to do lunch in Baltimore. We were on our way to a vegan place (for Teh Sister) and I suggested seafood since we were in Baltimore. She agreed. We ended up at Mama's on the Half Shell where we had AMAZING food and the worst service I may have ever gotten, ever. As in, Teh Sister was trying to flag our waitress down as she was talking with another server. The other server pointed at Teh Sister, our waitress turned and looked at our table, and then.. she turned and walked in the opposite direction. This was after I'd waited for well over 15 minutes for ketchup and Teh Sister was out of water. 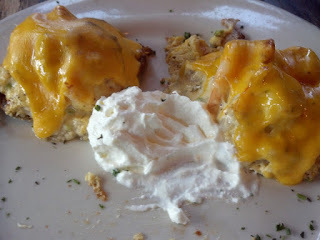 Appetizer: Seafood Potato Skins... these were TO DIE FOR. Teh Sister got the Wahoo Wrap she LOOOVEED it. And she was very sad when I told her she wasn't bringing leftover fish in the car since she could only eat half of the wrap. She picked the fishies out and ate them before we left it was so delicious. Since I was a waitress before joining the Navy, I understand the job. We'll just say it wasn't my favorite job I've ever done, and even with my attitude problem, I would have never walked the opposite direction of the table under those circumstances. I consider myself a pretty good tipper, granted you have to do more than take my order and deliver my food to get more than 15-18%, but this girl.. Well. My bill was $19.43. I left her a $0.57 tip to bring my total to $20. We were there for 2 HOURS. I was LIVID when I left. I even left a note on the signed receipt that explained why her tip was non-existent. I was hoping the manager would notice when they did end of day procedures honestly. After we finally left the restaurant, we were seriously on a mission to get to Teh NY Uncle's house. Suzy (the GPS) said we had an 8 hour drive till we arrived from Baltimore. We hit I-95N, on a mission. After paying $10 in tolls just to get to Philly, I called Miss Boomkin to get some alternative directions to miss some of the tolls. She gave us directions to go up the west side of NJ instead of going up the Jersey Turnpike. We found some interestingly named locations. Every time Teh Sister would try to say "Saugerties" I thought she was saying Socrates. We finally crossed the NY state line. Somehow we ended up going around Shank-the-tity (Schenectady) instead of by-passing it, which we're blaming on Teh Dad because he had called doing his stalker-parent thing. Once we got through Shank-the-tity, we were about halfway there. We stopped to get gas at "Socrates" before heading through Albany and through the Adirondacks to Plattsburg. We arrived around 1am to the relief of all. She had definitely hit "crazy hour" at this point. Friday was a lazy morning. That evening we went to visit Teh Gramps. He lives in an assisted living facility due to his Dementia. The stars had aligned and the prayers had been answered, Teh Gramps was having a good day. He recognized Teh Sister within a few minutes and myself after a little while, even if he couldn't remember our names, he knew who we were. We went on a walk, which really tired him out. We all looked through his photo album and he pointed out who certain people were to us. He ate a peanut butter no bake cookie Teh Sister had made (which he really enjoyed) and a slice of apple pie before we left. In true Teh Gramps fashion, he waved at us from the time we got outside the building where he could see us through the window until the car was out of sight. I can't even describe how grateful I was for a "good day". There are no words for that level of gratitude. The drive to get to Teh Gramps was about an hour, so Teh Sister passed out. After we got back to Podunk, my cousins invited us over for a bonfire. Equipped with rum drinks and s'mores ingredients, we headed to their house to enjoy the company of most of the wedding party. 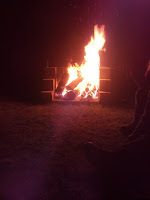 I showed off my insanely impressive marshmallow roasting skills while listening and sharing stories. Finally, around 10:30, we called it a night. We were exhausted and the bride had already went inside since she had an early start the following day. Saturday morning we had a relaxing start but we were wedding ready by noon:45, at the request of Teh NY Uncle. Since it was a Catholic wedding, there was a full mass, with Communion included. Teh Sister and I are still behind with the new sayings, but we definitely had the old sayings down pat. My gift to them is going to be wedding photos, so I was equiped with my "big" camera and flash. After Teh Worldwide Jesus Lover's wedding, I realized I needed a flash, so I was excited that I had followed through on that idea. And this was exactly how the Priest kept saying marriage. After the ceremony, there were photos and I realized that I can sometimes be quite imposing, but damn when you're the paid photographer, shouldn't you have a plan for the order/how to do the family portraits? There were a few that the photographer set up, but then she was like, ok whatever.. at which point Teh NY Aunt was telling me that she wanted certain photos and I also asked the bride what photos she wanted. I'd let the paid photographer do her shots first, and then I'd move in and take my photos. This is the 2nd wedding I've been to where I was doing the people directing. Also, I don't understand photographers who don't have a plan and just haphazardly put people with the couple to take photos. No. You start with everyone and whittle down. That way, everyone is there for their necessary shots and can leave (and get out of the way) when they aren't needed anymore... When you just do it without an order, people meander off and you have to track them down, which takes up even more time. UGH. Finally, after all the photos were taken, we headed to the reception. Most everyone was starving, but we waited through the introductions of the wedding party, the bride/groom dance/etc, the "dollar dance" (where you paid $1 (or more if you were generous) to dance with the bride/groom), the best man made a toast, and the 15 minutes for the bride and groom to mingle before dinner time started. Since we did not send in our RSVP (thanks to Teh Dad), we had to beg for food. We sent a text with the top photo in it to Teh Dad and his response was, "Hope you had a big lunch." After dinner (which we did get to eat), there was cake cutting, bouquet/garter tossing, and then the dancing started!! During a dancing break, later in the evening, there was a situation that happened with someone that wasn't supposed to be there, but after that dilemma was solved, the party was resumed. We were each other's date. Finally, everyone was tired, so we decided to head back to Teh NY Uncle's house. The non-groom NY cousin and his girlfriend came over to hang out for a little bit and finally around midnight, I called it quits and headed to bed. Sunday was the day we'd decided to head back to MD. I woke up around nine and decided that if I was going to be motivated, I should start the day with a shower. While I was packing up, Teh Sister showered. By 1030 we were packed and ready to hit the road. Teh NY Uncle suggested going out for breakfast and we agreed. We managed to get everyone together (even the bride and groom!) for breakfast before hitting the road. It was a great way to end the trip for sure. Everyone kept telling me to come back sooner than 8 years from now when we left (since the last time I had visited was 8 years prior). We stopped in Plattsburg to pick up a sticker for my water bottle (since we'd been in the Adirondack mountains) and maybe got distracted with a bit 'o shopping (Bath and Body Works was having a 75% off sale, I couldn't restrain myself). Finally, we started our 10 hour journey back around 3. We struggled and struggled and got irritated when after several attempts to find a toll calculator for a road trip, we failed. We even stopped to get a cannoli and dinner and pulled into a McDonald's to get free wifi so we could look on Teh Sister's computer to see if it was going to give better results than mobile versions of websites. NOPE. Teh Sister's 2nd cannoli. First cannoli was consumed standing at the shop counter. IN 2013, HOW IS THERE NOT A WEBSITE/SOMETHING THAT CALCULATES THE TOLLS FROM POINT A TO POINT B??????? Those stupid big long forms for NJ or NY don't count since I don't know the exits/names of the toll points I would go through to be able to calculate those things. HOW?!?! We made music videos to us singing along to the iPod, we debated stopping in Hershey, PA and getting a hotel and then going to the park the next day, then coming home on Monday night since we'd never been to Hershey, but we didn't stop. We finally made it home around 2am. You can mute the video if you want and you can skip ahead to 1:18ish to see the absolute best part. We unpacked the car and headed to bed. And then I got a very annoying motivated streak after washing my face... Since I had a wet washcloth, why not just dust my entire bedroom? Ugh. Overly-tired-230am-Teh-Megan is annoying. Apparently, when I woke up on Monday morning, the motivated streak wasn't gone. I called the Kia dealership and scheduled Yurtle for her 30,000 mile facelift. 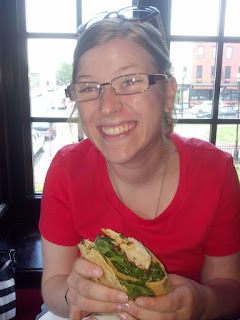 Teh Sister had decided she was going to drive on to NC, but humored me and had lunch with me in DC so I didn't have to sit at the dealership and wait all by myself for 2.5 hours while Yurtle was getting her insides did. 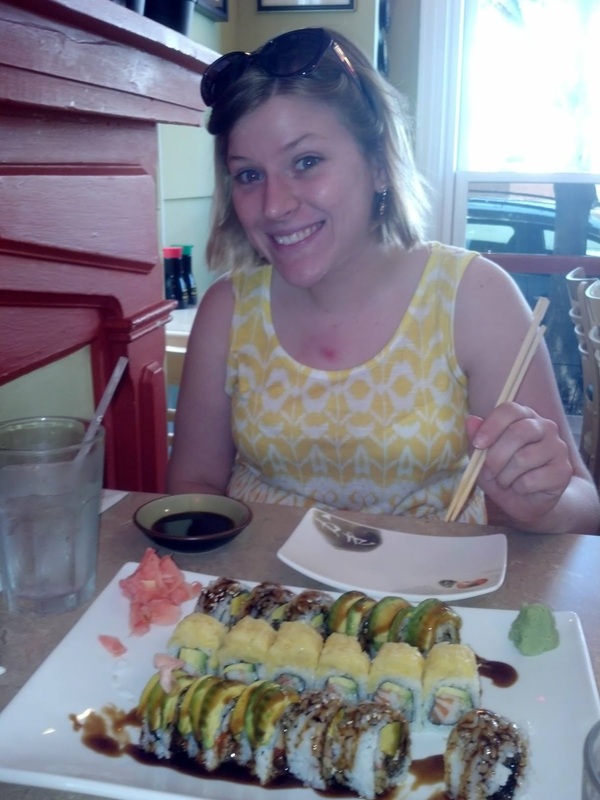 Teh Sister lucked out because we found a delicious sushi place in Old Town and she got to try Rita's for the first time. After we were full, she dropped me off and we went our separate ways. Momo Sushi and Cafe, you win. I'd summarize the weekend as successful! There was a road trip. No one was killed or lost. The trip wasn't stressful in anyway (other than trying to find alternative routes and going the wrong way that one time).